Everyone will tell you that Mendoza is great, and while I don’t like to follow the trend, I must agree with the masses on this one. While it isn’t mind-blowing, there is something pleasant and relaxing about this Argentine city. Set in the heart of wine country, Mendoza’s shaded sidewalk cafes, tranquil plazas and sycamore lined avenues provide the perfect base to explore the many sights and activities that the area has to offer, and make it a choice destination for almost any traveler. Some come for the shopping, dining and lively bar scene on Avenida Aristide Villanueva, others come for the adrenaline rush of rock climbing, sky diving, or horse back riding, but everyone, from near and far, comes for the famous Mendoza wine. In the mid 16th century a Chilean friar brought a cutting into the Argentinean countryside, giving birth to what is today an internationally known wine region. The European settlers in the 19th century greatly expanded the vineyards, bringing expertise from France, Spain and Italy and making wine a true component of Argentine culture. The railroad built in 1885 gave Buenos Aires a direct link to the wine producers and table wine became a regular feature at dinner parties and was drunk with gusto. Up until about a decade ago, Argentine wines were consumed almost exclusively by Argentines. But with recent improvements in quality and production, Argentine wines are now being sold and enjoyed internationally as well as locally. 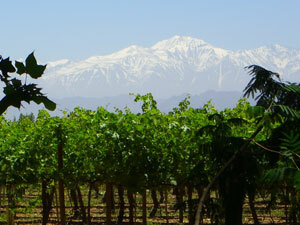 Mendoza is known for its red, Malbec, and lesser known but also delicious, the white varietals of the region, Torrontes. Wine country is vast, and the Bodegas and wineries numerous, a thorough exploration could take weeks. If you don’t have the time, or the right transportation, i.e. a car, a popular way to sample what the region has to offer is by bike. 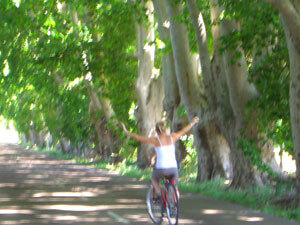 Several companies in Mendoza will rent bikes and inevitably your hotel will be able to provide information for you. If you are looking for a relaxed day, pedaling through the countryside at your leisure and sampling wines from family run wineries, then a day with Bikes and Wine should be on your itinerary. The 173 bus from downtown Mendoza transports you to the rental office in Maipu, half an hour outside of the city centre. Remember to carry sufficient coins since the coin shortage is rife in Mendoza, and you may be stranded for a ride home if you haven’t got the peso-thirty for the bus driver. A full days rental will put you back thirty-five pesos, and most of the tastings and tours cost five to ten pesos, a bottle of wine is fifteen pesos and up. On a twelve-kilometer stretch of quiet country road, there is a selection of wineries, an olive oil factory, a wine museum, a gourmet delicatessen and my favorite, a chocolate and liquors family run production. All are open for visiting, tasting, touring and enjoying. A map of the area is provided, and after slathering on the sunscreen and checking that your tires are road ready, the pedaling adventure begins. Being from California’s wine country, I am a little spoiled when it comes to beautiful sceneries and delicious wines. But while Napa may have the glamour, Mendoza is winning in charm. Biking down sycamore-lined roads, surrounded by rows of green vineyards and fields of olive trees, the frosted Andes reaching to the blue sky in the distance, it is hard to keep the smile off your face, especially after a few glasses of red. The wineries are family run and friendly, one of the wineries was even closed the day we visited since they had just welcomed a new baby boy into their midst. Tastings are usually accompanied by short tours and if your lucky you can chat with the owners while sipping different Malbecs, Cabernets and refreshingly chilled Torrontes. The tastings alone wont get you tipsy, but you can always sit and enjoy a glass of wine in the shade at Bodega Carinae. The riding is easy, the wines, chocolates, liquors and other delicacies are delicious, and as a daylong activity it is wholly relaxing and satisfying. For those uncomfortable on two wheels there are several guided tours by bus, car, or foot. During the summer months you can attend an Asado, typical Argentine BBQ, at several of the wineries, including dinner, wine tasting and stargazing. In March, Mendoza celebrates the harvest with the Vendimia festival, a wonderful experience but be sure to make reservations if you are arriving during the festivities. In the city itself there are several wine shops and tasting venues, including the swanky Vines on Calle Espejo, which has deluxe wine tasting and provides tons of information on the wineries in the region. Whatever your budget, your taste, and your desire, Mendoza has a bottle of wine waiting for you. Salud!